Rob Ford may not like the money spent on the waterfront, but after years of work and development, plans for the East Bayfront are finally coming to fruition. 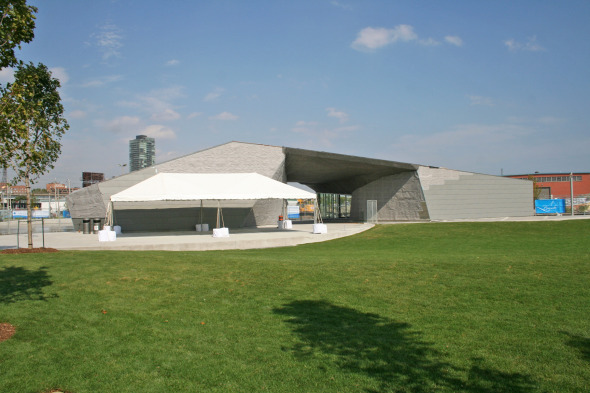 The latest Waterfront Toronto project to open is the southern portion of Sherbourne Common park. And it's both beautiful and functional. Running along Lower Sherbourne between Lake Shore Blvd and Lake Ontario, the park's innovative idea is that it's a water treatment facility as well as a place of recreation. Large tanks of water under the waterfront promenade hold stormwater runoff. There is also a UV treatment facility under the pavilion in the centre of the park. 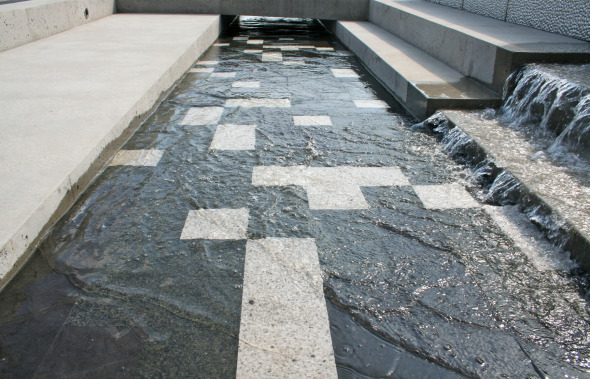 After the stormwater is treated, it's carried through a channel that runs along the length of the park, through a biofiltration bed, and into Lake Ontario. Despite its official opening, however, the park is not entirely finished. 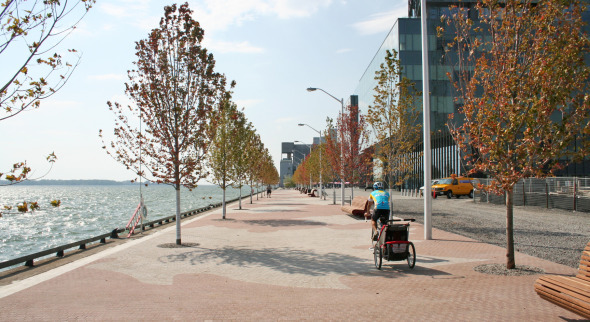 While the waterfront promenade, which will eventually run along the entire length of the East Bayfront, has been completed between Sherbourne Common and Sugar Beach, workers are still installing paving to the east. And the northern section of the park still has a great deal of work to be done. It's expected to be completed by the fall. 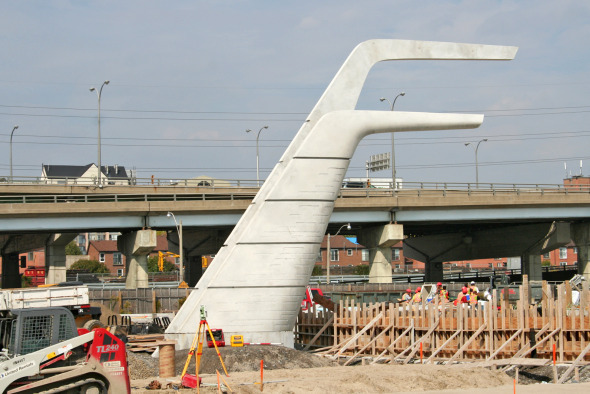 Completion of the park will also involve a realignment of Lower Sherbourne to meet up with Dockside Drive. sculptures for the northern portion of the park have already been installed. Water will be pumped up the sculpture's "arms", and then will gently sluice off them in sheets. 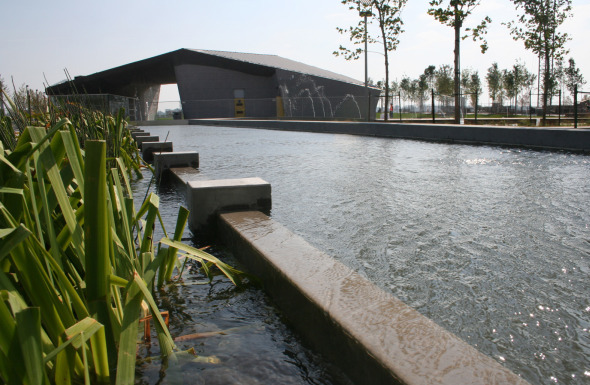 From there, the water will join the channel that runs the length of the park.The pavilion for the park is also not yet finished. As well as having the water purification systems underneath it, it will hold a snack bar and washrooms. Designed by Teeple - winner of the Pug Awards this year for 60 Richmond East - it will be covered in zinc when completed. Beside it is an area that will be a skating rink in winter and a splash pad in the summer.When I visited, the park already had a lot of traffic. Its sister park, Canada's Sugar Beach, was similarly busy. Although some fiscal conservatives may feel that expenditures on the waterfront may not be worth the cost, the popularity of these parks suggests that there is a strong demand among Torontonians for them. 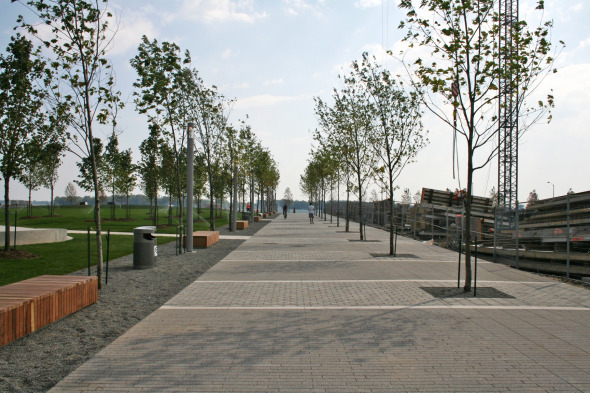 What do you think of Sherbourne Common? Do you plan on visiting?